Last night I taught a Move by Design class at the crossfit near my practice. I had the opportunity to connect with 20 new people, introducing them to the concepts of how they are designed to be extraordinary, and more specifically on how they are designed to move. But the best part of the night for me was in the form of a conversation I had with a woman afterwards. How often as adults do we try new things? Test our limits? See if we are strong enough, fast enough, creative enough, or brave enough? I think in this case, the attraction of crossfit is that adults are finding themselves in an environment of doing new things – sometimes every day – or in testing their limits. Much like when we were kids and we’d see if we could piggyback the heaviest kid, or run the fastest, or climb the highest tree, or jump off the highest ledge. Childhood comes inherent with the question of “I wonder if I can do that?” followed logically by the attempt to do so. We weren’t so hampered by the fear of getting hurt, or wondering if we’d look silly, or the fear of stepping up to the plate and failing. We simply did new things for the sake of trying something new. In my background of biology, psychology, and neurology, it fascinates me to uncover how we work. What’s amazing is that brain science has now proven that our brains can change at any point in our life – from cradle to grave. Amazing books, like that of Dr. Joe Dispenza (Breaking the Habit of Being Yourself) or Dr. Norman Doidge (The Brain that Changes Itself) go into this new understanding of how every new stimulus to the brain can make change. 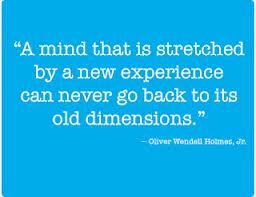 And the simple truth of neurology is that every time we do something new, our brain creates new pathways. Those pathways create the framework for all future activity, learning and perception. And with repetition, those pathways become strong. With this understanding, I get excited when people tell me changes that are taking place in their lives: kids starting new schools, people starting new jobs, families trying new activities. From the perspective of maximizing your potential – well, change is simply one of the best stimulants for growth. Again – not always easy, but definitely good for you. So… what can you try that is new? Truthfully, what are the actions that you do repetitively – and do you think they are helping you to grow? Do you test your boundaries? Try new things? Even new foods, new books, new routes home from work? Or are you going through life on autopilot? I for one, want to live my life to the fullest. For me, this also means continuing to stimulate my brain to grow. I am committed to being a lifelong learner. I wish to always see the world from a multitude of perspectives. I want to have new experiences, see new places, learn new things, test my boundaries, and ultimately live life to the fullest. Intellectually, experientially, physically – I want it all. I simply know that that means I need to stay open to a lifetime of trying new things, pushing the limits of my comfort zones, and taking imperfect action. (By that, I mean not waiting until every circumstance is just right – because just as anyone who has ever tried to plan a family knows, the ‘perfect time‘ just doesn’t exist. Sometimes we simply have to take the plunge in life.) Sometimes I will fall, sometimes I will find things I choose not to repeat. But the exhilaration of expanding my own abilities, understanding and horizons is just too tempting. I saw a post of a friend doing this yesterday, and I thought to myself: “I wonder if I can do that?” Up until today, I simply hadn’t tried. Sure, I had done lots of 20” and 24” box jumps – but testing to see how high I could jump? No, not yet – but it sure seemed like fun to try! At 40″ I tried and failed. (Even though I know I can do it.) But I’m thrilled with what I did today. Today I tried something new. I know I’m breaking ground. I know I’m just a little bit better for it. Next time it’ll be to test my limits.